Simple, nutrient-dense sweets with functional ingredients are by far my favorite thing to make for a week's meal prep. This last week included a lot of travel, and consequently a lot of snacks instead of meals. The write-up for this recipe happened mostly while on a flight to California, snacking on a few for sustenance. I'll be interning for the next couple of months in So Cal, focusing on the nutritional guidelines created by Weston A. Price and those of the GAPS diet. I'm beyond excited to see how interning in a field I'm actually passionate about will impact my future. These aren't healing principles and techniques I'm familiar with, but I'm a sponge for any and all information. From another source of holistic health and wellness knowledge, I've been advised to increase my selenium intake. I've been delving into the differences between reading blood work with conventional and function ranges. With this lesson I found my own test results to be falling low in the thyroid department according to both ranges. I've seen an improvement of symptoms like low energy since tweaking my diet and taking herbal supplements to convert T4 and T3. One of the dietary tweaks has included increasing my selenium intake, which is where the inclusion of brazil nuts in this recipe is coming from. Brazil nuts are a significant dietary source of selenium. They're an inflammation fighter, and while the conversion of T4 to T3 is happening some conversion enzymes are dependent on the trace element. Add all ingredients (except the optional coconut butter) to a food processor. Blend until a sticky ball of dough forms, the time will depend on the moisture level of the apricots you use. Pop mixture in the fridge for some 20 minutes or so, the mixture likely heated a bit from being in the food processor. Once cooled, grab about 2 tablespoons of dough using a cookie scoop or your hands. Roll into balls. 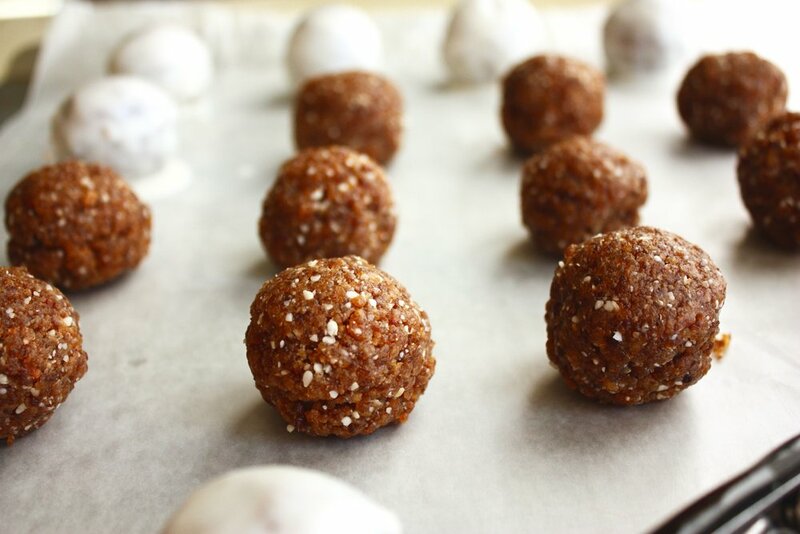 If you want to add a "glaze", melt some coconut butter to dip or spoon over the energy balls. Coconut butter can be melted in the microwave or over the stove, but be careful not to let it heat for too long as it will burn. With this coconut butter addition, it's not quite a munchkin but the look resembles a doughnut hole at least.